Weebleknits: Ravelry saves the day! What do you do when you're knitting a sleeve and realize you won't have enough yarn to finish the second sleeve and buttonband? You buy more yarn! I only needed two more skeins, but I lucked out and found someone on Ravelry selling twelve skeins of Knitpicks Swish DK in the right dyelot (!!! 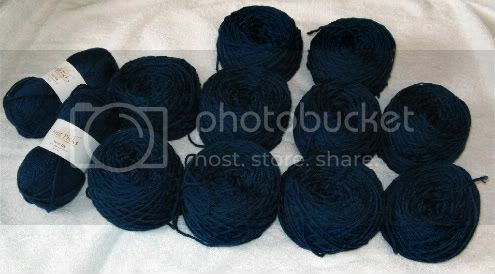 ), so I offered to buy it all to get my hands on those two skeins. Now I have enough yarn to make another sweater. I love this color (and will soon have two more children of siblings to knit for) so it wasn't a tough call. It also helped that the asking price was below retail and included shipping. I'm not sure how I ended up 2 skeins short, but I suspect my row gauge is different. I also made the body and sleeves a little longer to fit target niece better, she has a long torso and arms that outgrow sleeves before the rest of her catches up. Tip: List the dyelot of stash yarn you have up for sale, I wouldn't have bought this yarn if the dyelot # was missing from the description. Ravelry has a field for dyelot numbers and it is conveniently displayed when people are browsing stash yarn for sale, along with the photo and yarn name.